Preserving the history of Australia's Department of Civil Aviation, its predecessors and successors. 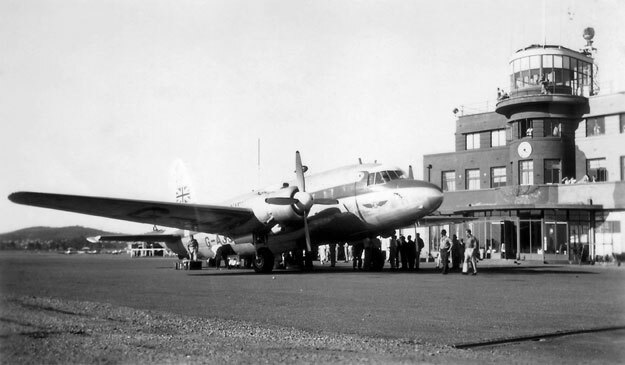 Below, Vickers Type 636 Viking Ib G-AJJN (cn 289) on the apron in front of the Ops/Admin building of Brisbane/Archerfield following its arrival from Darwin. The aircraft was on a manufacturer's demonstration and sales tour, and had departed Hurn, UK, on 13 April 1947 under the command of Squadron leader P. Roberts. The aircraft covered some 40,000 miles, ranging as far as New Zealand, and returned to the UK on 15 June. Unfortunately for Vickers, no sales eventuated in Australia or New Zealand. The Viking was an unpressurised development of the wartime Wellington bomber and could not compete at one end of the scale against the ready availability of cheap, war-surplus DC-3s and at the other end against the pressurised Convair 240, an order for five of which Trans Australia Airlines (TAA) placed the following year. G-AJJN was sold to B.O.A.C. in 1950 and named Vulcan. From 1955 to 1963 it passed through the hands of a number of second-level UK operators before being retired at Southend and later scrapped. On my website I show amongst others my collection of Dinky Toys. Recently I acquired Dinky Toys 705/070c Vickers Viking with registration G-AJJN. As this seems to be a repaint and the standard registration is G-AGOL, the registration of the 2nd prototype Viking, I set about researching. I found G-AJJN on a picture on your website http://www.airwaysmuseum.com/AF%20Ops-Admin-TWR%20c47%20outside.htm. I would like to show the picture and some data on the Viking page of my website, much like I’ve done with some other planes. Can you please grant me permission to do so?